Watch any 15 minutes of television and you’ll be forced to suffer through several car / minivan / SUV / pickup truck and oil-related commercials. Repeated ad nauseum. Over and over. Again and again. The most obvious / destructive / intrusive physical manifestation of our suicidal / ecocidal / biocidal / pro-genocidal (future generations) pathologies of endless growth / consumerism is “the ecological catastrophe that is the private car“, and all that has been required to enable its mass proliferation. First guy (white male): “Where’s Dave? And if this commercial is to be believed, “Dave” isn’t the only one who hasn’t made it. Women, children, people of all other cultures, and all other (formerly) living creatures — plant, animal or otherwise — make no appearance (with the exception of frogs that rain down from the sky). The pitch sells, its creators profit from, and we are intended to be amused and comforted by, the complete absence of morality, and the near total obliteration of civilization and nature. All that’s at stake, and my contempt for the betrayal / madness / greenwash it exemplifies! Electric, hybrid, diesel or not, when the mined, paved and war-based social and environmental injustices of the auto-industrial complex are considered, there’s no such thing as a ‘green’ or responsible vehicle. ‘Big Auto’ is a major contributor to (among many other impacts) the accelerated death spiral of Arctic ice meltdown which, at the very least, has caused now-endangered, fast and fierce (NOT huggable or “cuddly”) polar bears to drown after days of swimming to reach ice, starve to death after extended periods in search of food, and cannibalize others of their own species in utter desperation. While a similar greenwash critique applies to the Audi, “Green Police”, ‘clean’ diesel spot below, of interest may be the depiction of a kind of police state, or the suggestion of the potential need for, or future threat of, such oversight. 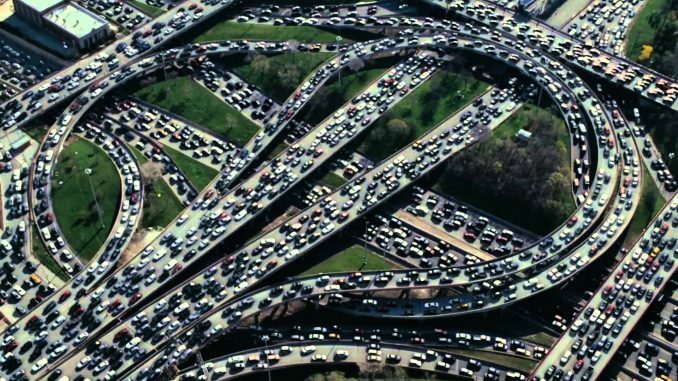 Traffic congestion creates stress and induces aggression, particularly towards cyclists, pedestrians, traffic lights and speed limits ― anything that might slow the mighty car down. Toxic pollutants from tailpipe and particulate matter from tyre rubber (treated with dozens of carcinogens, neurotoxins and heavy metals) create health havoc from respiratory disease to cancer. Cars also “make you fat”, with all the attendant diseases of obesity. The car is a huge devourer of space ― roads, garages, petrol stations and parking make up between one-third and one-half of the total space in US cities. The two million cars added to the US automotive fleet each year require asphalting space equivalent to 400,000 football fields, paving over prime farmland. Parking is an omnipresent visual blight on the urban landscape and the car promotes an ugly urban housing sprawl. The car is economically wasteful, chewing up 20% of GDP in the US (compared with 9% in Japan with its mass transport system). The cost of running a car soaks up one third of the working life of the average US citizen. Inefficiency is its byword ― only 30% of a car’s petrol is turned into actual motion to carry just 10% of its weight, so only “3% of the fuel’s energy actually moves what needs to be moved”, Mugyenyi and Engler write. The ecological tyre-print of the car is huge even before it leaves the sales yard. Each car requires huge quantities of water, metal and rubber, while generating tonnes of solid and airborne, often toxic, waste. The car’s life-blood, oil, is one of the most environmentally dirty industries globally. The transport sector in the US is the nation’s leading source of greenhouse gas emissions. The petrol-driven, internal combustion engine guzzles 63% of the 20 million barrels of oil consumed each day in the US. “Peak oil” and rising petrol prices are spurring on the rise of even dirtier “unconventional” fuels such as tar sands, shale oil, genetically-modified ethanol, deep sea oil and liquefied coal. Importantly, the authors puncture the desperate delusion that “alternative” fuels can solve “the ecological catastrophe that is the private car”. Corn-based ethanol produces more CO2 than oil-based petrol “if all the energy used in the growth phase is properly accounted for”. Corn-as-fuel also takes up five times more land than corn-as-food. Using hydrogen or electricity to power US cars would need more dirty coal as an energy source. Either that or an area as large as the state of Massachusetts for solar panels, or New York State for wind turbines, or 200 new nuclear energy plants. “There is no such thing as a green car,” the authors conclude. “Unsustainable” would barely describe the car’s environmental failure if the rest of the world were to adopt US patterns of car ownership and driving behaviour. So why is the car such a protected species, culturally celebrated and immune from radical policy review? Because, the authors say, the car is integral to the capitalist economy and thus any criticism of the car is taboo. Since 1925, the automotive industry has been the leading sector of the US economy, and, of the world’s 10 largest corporations, three are car manufacturers and six are oil companies. The logic of maximising corporate profit through the car, they write, is compelling to all manner of capitalist industries that sell vastly more glass, rubber, steel, aluminium, plastic, paint and other products for the car than they ever would for the puny bike or efficient train. With this economic power of the “auto-industrial complex” comes political power and access to huge government welfare programs. This offloads the private costs of the car onto the public purse for roads, police, hospitals and environmental repair, while government tax concessions, grants, bailouts and other subsidies are freely on offer. Public transport, denied the aura of corporate profit, is the sickly runt of the transport litter whose strongest offspring gorge on the teat of public welfare. This need not be so, say the authors. Raising the costs of driving and restricting car space are necessary sticks to the necessary carrots of investments in pedestrian, cycling and public transport infrastructure and people-centric urban design. Making public transport free is essential, they argue. They cite Belgium’s third biggest city (Hasselt), which enjoyed a 1300% increase in public transport use over 10 years of free mass transit, and Ockelbo in Sweden, which had a 260% rise with half the new public commuters being former drivers. All that stands in the way of a green transport future is the “concentrated private power of corporations” in the oil and auto industries. The car and capitalism stand together. They must fall together too. RIGHT NOW, our shared atmosphere is on an accelerating course to reach a state of potentially unsurvivable, runaway climate extremes during the lives of today’s children (+4C by 2060s or sooner incompatible with organized civilization). Each of the ads we commented on above are exceptional and leave no doubt that advertisers, if motivated, could expose the negligence of our wasteful, consumerist culture in broad, effective, powerful and palatable ways. Imagine the possibilities if, instead of the mass-production, sale, consumption of disposable, built in obsolescent stuff, similar efforts, creativity and resources were reallocated to restore, enhance, defend. preserve all the natural systems that sustain us. Only EMERGENCY international action at EMERGENCY speed *may be* proportional enough to confront the scale, scope and urgency of what is already the greatest crime against humanity, most life and most future life EVER (Compilation: CON JOB – Part 1, Part 2 and especially Part 3).